The Trump administration has signaled that it might be willing to rejoin the Trans-Pacific Partnership, but it may be too late -- and American farmers could lose out as a result. David Malpass, undersecretary of the treasury for international affairs, said at a lecture Wednesday that the U.S. would consider re-entering the pact if it could be renegotiated more favorably. His comment echoes President Trump's remark at the World Economic Forum on Jan. 25 that he would be willing to come back to the table. That came two days after the 11 remaining TPP nations reached an accord that they plan to sign in March, and Japan's Prime Minister Shinzo Abe said it would be difficult to renegotiate, Taisei Hoyama reports for Nikkei Asian Review. Trump's first official act was to withdraw from the TPP, saying that it wasn't a good deal for Americans and that he prefers bilateral trade agreements. His comment at Davos didn't get much press because he didn't follow up, and "There's another reason to wonder how serious Trump is," Urban Lehner writes for DTN/The Progressive Farmer. "Interest groups, including the farm lobby, have been complaining about the administration's failure to replace TPP with a Japan bilateral. A cynic might wonder if having failed to convince the Japanese to negotiate bilaterally, the president dangles the possibility of re-entering TPP to keep the interest groups at bay." Whether that's true or not, it's clear American farm groups are getting more nervous. The day the new TPP accord was announced, the Asia-Pacific Working Group, which represents more than 95 percent of the American farming, ranching and food processing sector, sent a letter to U.S. Trade Representative Robert Lighthizer in support of the U.S. rejoining the TPP, Lehner reports. The Asia-Pacific Working Group is a part of the U.S. Food and Agriculture Dialogue for Trade. The new pact would be a "disaster for farmers" in the U.S., says Glen Squires, CEO of the Washington Grain Commission, costing American wheat farmers $3 billion over the next 10 years. Japan is the biggest international customer for U.S. wheat, but wheat from Australia and Canada would be much cheaper under the new pact. U.S. Wheat Associates estimates that Japanese imports of U.S. wheat would fall by 2.5 million bushels annually, KREM-TV reports. Though J.C. Penney stores were popular with small-town and rural farmers in the early 1900's, few knew about the retail mogul's passion for improving the lives of animal agriculturists. David Delbert Kruger's new biography, published by University of Oklahoma Press, focuses on just that. 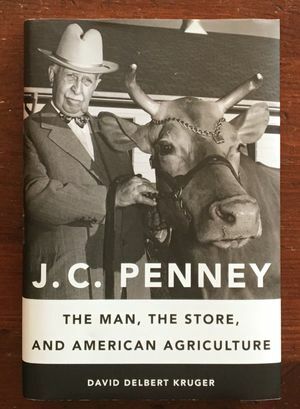 In J.C. Penney: The Man, The Store, and American Agriculture, Kruger brings readers back to Penney's roots as a Missouri boy whose Baptist-preacher father eked out a living on the family farm. Penney wanted to attend college but needed to support his family. So he took a job in retail, and eventually took a job at a Colorado dry-goods store, The Golden Rule. His work ethic impressed the owners so much that they allowed him to open his own store in Wyoming. When the owners dissolved their partnership in 1907, he bought all three stores and launched the J.C. Penney Co.
Penney established his corporate headquarters in New York City, and bought some acreage north of the city where he could enjoy a hobby farm. But his interest in agriculture didn't end there. "Penney recognized that his store customers made a living off the land. The productivity of dairy cattle in rural America, for instance, was much lower than dairy cows in Europe," Bill Spiegel writes for The High Plains Journal. "In 1921, he began buying the best Guernsey sires and dams from around the world, bringing them to his Emmadine Farm in New York. From 1927 to the farm’s dispersal in 1953, Penney eagerly shared his knowledge with other dairy farmers, and sold progeny from his Foremost Guernsey herd in an effort to boost profits of the people who were his primary store customers." Though his forays into agriculture weren't always successful, Kruger paints a picture of a man who worked hard to improve farm animals' genetics and American agriculture overall. Mount Airy, N.C., population about 10,000, was the inspiration for the fictional town of Mayberry in "The Andy Griffith Show," starring its most famous native. On the show, neighbors were neighborly, and the town's problems could be solved in a half hour, but the reality is different. 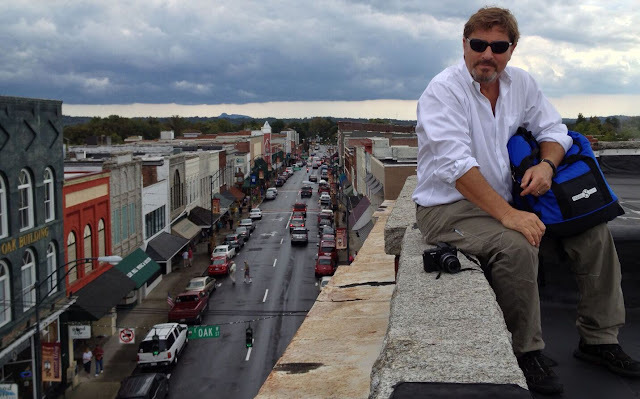 With his new documentary "The Real Mayberry," Mount Airy native Bill Hayes takes us beyond the pat answers of a TV show and digs into the problems and promise of living in a small town. "But like any honest look at small-town America, the engaging film has no pat answers. What it does have are the right questions: What is special about our place? What is here that we can build on? How do we create opportunity while preserving what we love? And how do we pass on our town to a new generation that has new ideas?" Tim Marema writes for The Daily Yonder. "Your hometown may not have inspired Andy Griffith, but we bet it has more than a little in common with this former mill town on the North Carolina Piedmont." Mount Airy and Surry County have struggled with the decline of three major industries: furniture, textiles and tobacco, and have in recent years embraced the Mayberry identity to attract tourists. "Like Mount Airy itself, Hayes’ documentary uses the pop-culture notoriety of Mayberry to create a connection," Marema reports. "Once you’re inside the city limits, the viewer is prepared to have a much deeper conversation about the future of small-town America." Hayes told Marema that he made the documentary because "Our country is built on small towns in rural America and I feel like they're misunderstood and don't get the proper nurturing." West Virginia has decided that its Medicaid program will cover treatment for babies born dependent on drugs. The state, which has the nation's highest rate of infants born addicted and the highest rate of drug-overdose deaths, is the first to grant such coverage. That was welcome news at Lily's Place, a recovery center for infants in Huntington. 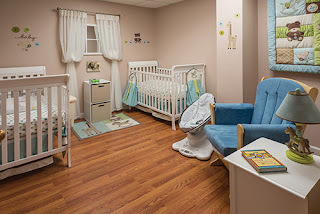 The 12-bed facility, opened in 2014, is the first of its kind in the U.S. and provides care for about 100 babies each year. The lack of coverage "has been a source of uncertainty for Lily's Place, so we welcome this announcement," Executive Director Rebecca Crowder said in a statement. "This designation will allow us to continue to offer compassionate care to newborns in need." "Crowder said the hope is to enable more infant drug rehab centers to open nationwide. A bill introduced in Congress last year is aimed at helping such facilities overcome regulatory hurdles and receive Medicaid-service reimbursement," John Raby reports for The Associated Press. UPDATE, Feb. 22: The president of Tennessee Tech asked EPA not to use or refer to the study until its investigation is completed. EPA said it did not use the study as a basis for withdrawing the rule. 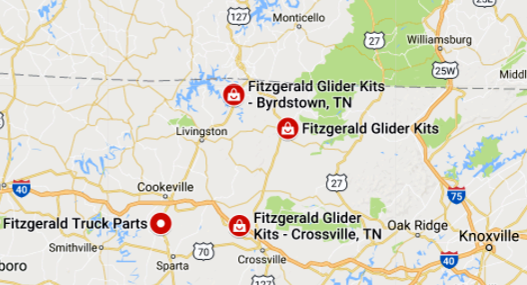 When the Environmental Protection Agency restored an exemption for big trucks made from old engines and new chassis called "gliders," it helped a fast-growing manufacturer in rural Tennessee that had pulled political and academic strings to make its case. But it was bad news "for an array of businesses and environmentalists," because the old engines "spew 40 to 55 times the air pollution of other new trucks, according to federal estimates," Eric Lipton reports for The New York Times. Under the Obama administration, EPA tried to close the loophole, but before that move could take effect, Tommy Fitzgerald of tiny Byrdstown, Tenn., hosted President Trump and lobbied EPA Administrator Scott Pruitt, and got help from U.S. Rep. Diane Black (whom he helped by rounding up $225,000 in contributions to her campaign for governor) and Tennessee Technological University, which took Fitzgerald's money to do a study that minimized the loophole (and is doing a “misconduct in research” investigation at the demand of faculty) and may build a research center with Fitzgerald money. In their defense, Fitzgerald and Black wave the rural flag. “I don’t know why anyone would want to kill all these jobs,” he told Lipton, who notes "the several hundred people he said he employs at his dealerships, many of them in rural areas." A Black spokesman told Lipton, “There are very few companies willing to try and keep manufacturing jobs in rural Tennessee today, and Diane fights hard to support the few that do.” An EPA spokeswoman said Pruitt accepted Fitzgerald and Black's argument that EPA lacked authority to regulate the trucks and his decision was unrelated to politics. Fitzgerald is the nation's largest glider maker, Lipton reports: "The trucks, originally intended as a way to reuse a relatively new engine and other parts after an accident, became attractive for their ability to evade modern emissions standards and other regulations. . . . The trucks, which Fitzgerald claims burn less fuel per mile and are cheaper to repair, have been on the market since at least the 1970s. But after the federal government moved to force improvements in truck emissions, with standards that were first enacted during the Clinton administration and took full effect by 2010, gliders became a way for trucking companies to legally skirt the rules." For an analysis by the Environmental Protection Network, which favors the standards, click here. Lipton adds, "The glider trucks take advantage of other regulatory loopholes. Since most of the engines were manufactured before 1999, the trucks are exempt from a federal law that went into effect in December intended to prevent accidents caused by fatigued drivers. The law requires commercial truck drivers to use an electronic logging system to track how many hours they spend behind the wheel, and to take mandatory breaks. The law covers truck engines manufactured after 1999." Some gliders "are not subject to a 12 percent federal excise tax imposed on truck sales, because they are not considered new trucks. Ms. Black intervened with the Internal Revenue Service last year, along with three other members of Congress, to protect that tax break." Eastern Kentucky, the region that has suffered the greatest job losses during the coal industry's recent slide, had 6 percent more coal jobs at the end of 2017 than a year earlier, Bill Estep reports for the Lexington Herald-Leader. The estimated number of coal-industry jobs in the state's eastern coalfield was 4,055, far below historical levels. The region had 13,671 coal jobs in 2011. Coal production in Eastern Kentucky rose 9.4 percent in 2017, but statewide production was down 1.6 percent, to 42 million tons, due to a decline in the western coalfield, part of the Illinois Basin. The state. 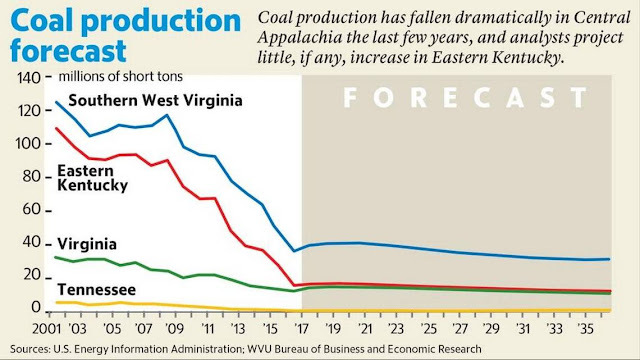 Officials and experts do not expect Appalachian Basin production to increase much if any. "Drought conditions have been widespread across the United States due to the La Niña weather pattern seen in the area for the past few years, but relief could be seen soon," Jennifer Carrico reports for the High Plains Journal. She cites CattleFax meteorologist Art Douglas, who says that in about three months the La Niña weather system will transition to a weaker El Niño pattern, which likely bring relief from the drought in the Western states. 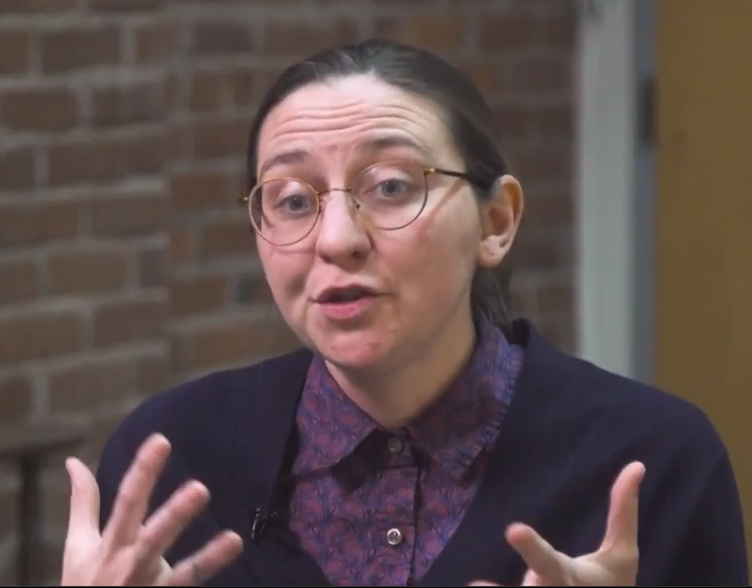 According to Douglas, "If weaker El Niño conditions develop this summer, conditions at that time could be milder through the Midwest, but drier soils in the Plains and Southwest could create feedback mechanisms that increase heat in these areas. The Northwest and northern Rockies may have the only reliable grazing into late spring and summer," Carrico reports. If the La Niña conditions continue to keep Argentina and Brazil dry for most of the summer, demand for U.S. exports of grain and beef could increase. Corn prices could move higher in the summer, according to CattleFax market analyst Mike Murphy, who predicts an average yield of 172 bushels per acre. And if cattle exports are up, more grain will likely be needed for feed. And if cattle exports are in demand, CattleFax analyst Kevin Good told Carrico that beef will likely stay profitable, especially if foreign demand for beef exports continues to grow. Rural residents tend to be poorer, older, and have more health issues, such as obesity, dementia, substance-abuse, and other behavioral and mental health problems. On top of that, they have less access to long-term care for those conditions, a phenomenon explored by Carrie Henning-Smith, an assistant professor at the University of Minnesota School of Public Health. "Not being able to secure timely, appropriate nursing home care can lead to patients languishing in hospital settings for much longer than is necessary or appropriate," Henning-Smith told Charlie Plain of the university's public-relations office. "This can come at a high cost to individual patients, state and federal programs, and individual hospitals. The lack of choices can also lead to people being placed in settings far from their homes, which can make it difficult for loved ones to visit." Henning-Smith's first study, published in the Journal of Applied Gerontology, looked at the barriers rural hospital discharge planners reported in finding nursing home care for non-elderly adults. A second study, published in the Journal of Aging & Social Policy, examined non-medical barriers that rural hospital discharge planners reported in finding nursing home care for rural residents. Henning-Smith found that planners had trouble placing patients in long-term care mainly because of finances, lack of transportation, infrastructure, the availability of nursing homes, and timeliness in responding to referral requests. Some patients couldn't afford a nursing home because they made too much money to qualify for public assistance but too little money to pay for treatment. Also, some younger patients felt they wouldn't fit in well at a nursing home full of seniors. Some patients had to be placed in a long-term care facility because they didn't have a family member able to act as a caregiver. And discharge planners had a hard time finding rural placements for patients with complex medical problems that required specialized care. "There are a variety of ways to improve access to appropriate long-term care for rural residents, including addressing long-term care workforce shortages — especially for people without loved ones to care for them," Henning-Smith said. "They also need to look at addressing infrastructure in rural areas — including the availability of non-emergency transportation — and support ways to provide long-term services and assistance in settings other than nursing homes if a patients’ medical and psychosocial needs can more appropriately be met at home." On Monday the White House gave the green light to a national research effort by the Centers for Disease Control and Prevention to see which treatments are the most effective for the more than 2 million Americans addicted to opioids. Drug treatment is less available in rural areas. Experts agree that medication-assisted therapy is the most effective way to treat opioid addiction, but the CDC says the study is needed because little data exists about the risks and benefits associated with each form of MAT. Each drug used in MAT has different characteristics and administration methods that can affect how well patients respond to the treatment. "The study will target 60 treatment facilities and four primary-care facilities in 11 regions across the country that cover some of the states hit hardest by the epidemic. That list includes Alabama, California, Kentucky, Ohio and West Virginia, among others." Virgil Dickson reports for Modern Healthcare. "The study will follow patients at these facilities over two years to better understand the factors of when medication-assisted treatment does or does not work. Individuals pursuing counseling without medication will also be followed. The International Society of Weekly Newspaper Editors, citing a shortage of entries, has extended the entry deadline for its Golden Quill editorial-writing contest to March 1. The winner will get a scholarship and travel expenses up to $500 to ISWNE's annual conference in Portland, Ore., July 11-15. Any of the 11 runners-up who have not attended an ISWNE conference will also get a scholarship. All newspapers that publish fewer than five days per week are eligible. Entries must have been published during 2017 and should identify local issues that are, or should be, of concern to the community; offer an opinion; and support a cause of action. You can nominate someone else's editorial(s) or send your own, and you can enter two editorials per person. The cost is $20 per person for ISWNE members or $25 for non-members. If two people are entering from the same newsroom, the cost is $40 for ISWNE members and $50 for non-members. Click here for more information about the contest, and click here for a printable entry form with more specifics about how to enter. Grassroots Editor, ISWNE's quarterly journal, will republish the 12 best editorials in the Summer 2018 issue. The shortage of doctors and drug treatment in rural areas hamstrings efforts to fight the opioid epidemic. Medication-assisted therapy, which requires a prescription, is the most effective treatment. The Drug Enforcement Administration announced in late January that nurse practitioners and physician assistants can get a waiver that allows them to prescribe and dispense opioid maintenance drugs. But lawmakers in several states have gone a step further, seeking to expand the scope of practice for nurse practitioners and physician assistants in rural areas where there is often no doctor. In Georgia, Republican Sen. Renee Unterman, chair of the Senate health committee, has introduced a bill that would give rural nurse practitioners more latitude to treat patients. Nine of the state's 159 counties have no physician, and dozens more have no pediatricians or obstetrician/gynecologists. "Proponents argue expanding the scope of practice for nurse practitioners could help fill in the health-care gaps in a growing state with increasing needs, especially with primary care. Nurse practitioners can also specialize in certain areas, such as pediatric care or mental health treatment," Jill Nolan reports for the Valdosta Daily Times. In April 2017 the Pennsylvania Senate passed a bill to let nurse practitioners to practice on their own after fulfilling a three-year, 3,600-hour formal agreement with a physician, Jan Murphy reports for Penn Live. "There are not enough doctors willing to practice in smaller communities and as older doctors retire, fewer new doctors are coming in to replace them," said the bill's sponsor, Republican Sen. Camera Bartolotta. "Thankfully, there is a solution that holds the promise of easing this looming health care catastrophe." Texas passed two related bills in 2017: one that allows nurse practitioners in under-served areas to see Medicaid and Children's Health Insurance Plan patients without a doctor's supervision, and one that allows APRNs and physician's assistants to sign death certificates. Nurse practitioners had protested having to pay up to six-figure contracts with doctors that would allow the nurse practitioners to treat patients and write prescriptions, Mariana Alfaro reports for The Texas Tribune. Sinclair Broadcasting Group, the nation's largest owner of TV stations, is asking some of its newsroom managers to contribute to its conservative-oriented political action committee, which some journalism ethics experts say is highly unusual and opens the door to an ethical breach. Rebecca Hanson, Sinclair's senior vice president of strategy and policy, said the request for PAC funding wasn't unethical because it was only sent to newsroom managers, not reporters or anchors. The news directors "were solicited as a result of being part of our managerial level, not because of their role in editorial," Hanson told Paul Farhi of The Washington Post, and added that "participation is completely voluntary. There is no corporate pressure to participate and no consequence for not participating. It doesn’t put them in any ethical bind whatsoever." But University of Wisconsin journalism professor and former TV news producer Lewis Friedland told Farhi that the request "violates every standard of conduct that has existed in newsrooms for the past 40 or 50 years" and said that news directors who donate are tacitly supporting the company's political agenda. "It would cause people to ask whether they’re being fair and balanced in their coverage," Friedland said. And news directors might feel pressured to contribute, and worry that refusal would be seen be company superiors as disloyal, Mark Feldstein, a broadcast journalism professor at the University of Maryland, told Farhi. Sinclair owns 173 stations, and would grow with its pending $3.9 billion purchase of 42 owned or operated by Tribune Media. "The company is fighting to preserve an arcane rule adopted by the Republican-dominated Federal Communications Commission last year that effectively enabled it and other big media companies to buy more stations. If Congress were to restore the old limits, or if a pending court challenge succeeds, it could complicate Sinclair’s acquisition of Tribune," Farhi reports. Sinclair has been criticized for partisan news coverage. In 2004 it wanted to air a documentary critical of Democratic presidential nominee John Kerry the night before Election Day, but backed off after complaints. In 2012 it aired a half-hour news special critical of President Obama. In 2016 it reportedly ordered its stations to air news stories favorable to Donald Trump. In 2017 a Sinclair station in Montana refused to cover the story of U.S. Rep.-elect Greg Gianforte attacking a reporter, saying that he worked for a biased publication. And today, stations are told to air conservative commentaries from Sinclair executive Mark Hyman and former Trump aide Boris Epshteyn. Prisoners often get messages from loved ones in letters, but how about by radio? WMMT-FM in Whitesburg, Ky., has a unique show, "Calls From Home," that for 20 years has broadcast loved ones' recorded messages to inmates in nearby prisons. More than 5,000 men are incarcerated in six federal and state prisons in the range of WMMT, in Kentucky and Virginia. It's no coincidence that so many prisons are located near Whitesburg. "Pitched as a new source of economic development amid coal power’s decline, prisons began sprouting up around Appalachia in the 1970s," Henry Gass reports for The Christian Science Monitor. "Most people in the community don’t have a problem with new prisons being built in the area . . . though they have grown skeptical of the promises of thousands of jobs." However, "When prisons started coming in to the region . . . the inmate population and the local population were very much pitched against each other by the department of corrections and state officials," Rose Hackman of The Guardian reported in 2016, after interviewing Amelia Kirby, who started the program when she worked at WMMY, a service of the Appalshop arts-and-culture cooperative. Gass reports, "WMMT bills itself as 'a 24-hour voice of mountain people,' and as far as the station is concerned, if the inmates can tune in, then they are mountain people too." 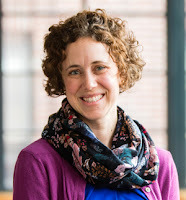 Elizabeth Sanders, WMMT's co-general manager and a producer of "Calls From Home," told him, "Anything we can do to help make the barriers between them and their families a little bit less, then we’re fulfilling part of our mission as the radio station here." The radio messages are the only way some people can connect with their incarcerated loved ones because of difficulties finding transportation to the prison and the expense of calling a prison. It sometimes cost more than $10 per minute to call someone in prison until the Federal Communications Commission announced a rule in 2015 capping how much telecommunications companies can charge for such calls. If you're planning to drive the Blue Ridge Parkway to see spring blooms, you may have to take a detour or two. 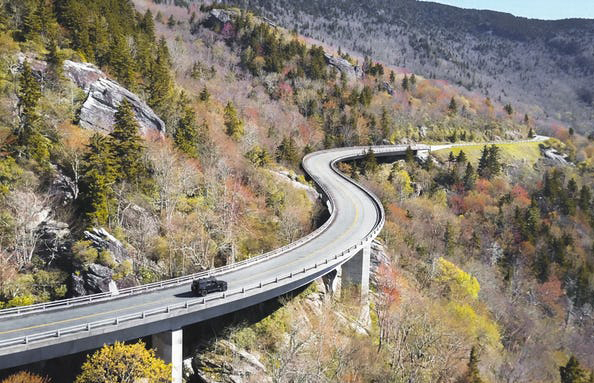 A signature stretch of the federal road, the Linn Cove Viaduct around Grandfather Mountain in North Carolina, will be closed from March 1 until May 24, just before Memorial Day. "A seven-mile section of the parkway will be completely closed to traffic. The section of the Tanawha hiking trail below the bridge will also be closed," Karen Chavez reports for the Asheville Citizen-Times. "A traffic detour will be put in place from Milepost 298.6 at Holloway Mountain Road to Milepost 305.1 at U.S. 221." Chavez explains, "Road work at high elevations must take place in a small window between weather conditions suitable for paving projects, and to cause as little impact to the visitor season as possible, said parkway spokeswoman Leesa Brandon." Other parkway sections are closed or will be; for a real-time map, click here. The repaving will be the first since the viaduct opened in 1987, completing construction of the 469-mile parkway from Shenandoah National Park to Great Smoky Mountains National Park. "The views along the winding viaduct are a huge tourist draw to the parkway, which is the most visited site in the National Park Service. More than 16 million people visited the parkway last year," Chavez reports. President Trump's proposed budget for the fiscal year beginning Oct. 1 calls for a 16 percent decrease in Department of Agriculture spending. Bryce Oates reports for The Daily Yonder, "While the document is vague about some proposed changes, the budget cuts appear to be targeted primarily at Supplemental Nutrition Assistance Program benefits and eligibility, changes to farm subsidies and crop insurance, decreases in conservation spending, and cuts to some Rural Development programs." SNAP, better known as food stamps, accounts for 80 percent of spending in the five-year Farm Bill. Some SNAP recipients would be required to work to keep benefits. The budget also proposes delivering non-perishable foods such as "shelf-stable milk, peanut butter, canned fruits and meats, and cereal" in a box to SNAP recipients, rather than allowing them to choose what foods fit their family at the grocery store, reports Helena B. Evitch of Politico. "The proposal was so out of left field that some anti-hunger advocates initially thought it was a joke." Subsidies would be eliminated for higher-income farmers and "overly generous" crop insurance premiums to farmers and payments made to private sector insurance companies would be reduced. Underwriting gains for insurance companies would be capped at 12 percent. Community Connect, the rural broadband grants program, would maintain $30 million in funding, but broadband development loans would be cut 15 percent to $23 million and the distance learning program would be cut by 10 percent to $24 million. The Farm Service Agency, the Risk Management Agency, and the Natural Resources Conservation Service would be combined into a Farm Production and Conservation office. Funds are included for the Trade and Foreign Agricultural Affairs division to help increase agricultural exports. Funds would be reduced for the Economic Research Service by eliminating what the plan calls low-priority research already being conducted in the private sector or nonprofits. Wildfires would be treated like other natural disasters like hurricanes, floods or tornadoes. The rationale: The cost of fighting wildfires last year hit a record $2.4 billion, which meant money had to be taken away from wildfire prevention programs to pay for it. The Rural Economic Development Loan and Grant Program would be eliminated. Conservation programs would see reduced funding, though the details weren't included in the proposed budget. Interest payments to electric and telecommunications utilities would be eliminated. "The Trump administration’s budget proposal appears to be significantly different than what could emerge from the Congressional budget process," Oates reports. "Just last week, the House and Senate agreed to guidelines on a two-year funding package for federal spending that includes increases in both military and domestic spending programs. The size and scope of those budget details will be negotiated by House and Senate appropriators over the next several weeks." When Protection Press community columnist Bonnie Brown gathered news for "Bonnie's Blog" in the weekly paper, she went on foot; she gave up driving when she was 98. And in her eight years of writing for the Press, she only missed two deadlines — one last year when Protection was evacuated for wildfires, and a few weeks ago when she caught a cold. But the upbeat woman who many think was Kansas' oldest working columnist was found dead in her apartment Saturday morning, just 11 days before her 103rd birthday. Her son, Rodney Brown, said her cold had turned into pneumonia. "In her last column, published this past week, Mrs. Brown wrote that she wasn’t feeling 'up to par yet but hope I am on the last mile … If all goes well, I may make it for my next birthday. One never knows what’s in store for any of us,'" Beccy Tanner reports for The Wichita Eagle. It's not just Brown's passing that's worthy of mourning, but her increasingly rare style of gathering news: the 4-foot, 5-inch columnist gathered news "the old-fashioned way — with shoe leather and an inquiring mind" as she beat the pavement every day gathering local news in the town of 500, Tanner reports in a different story for The Eagle. "Her column style — of reporting on who was in Protection, who went to visit who, what so-and-so is doing now – is a style of journalism that began to disappear in daily, and then weekly newspapers, in the 1970s and 1980s." But it remains in many weeklies. Protection Press Editor Susan Edmonston told Tanner, "People are going to miss her but she was such a positive, upbeat person, we think she is up there, walking around, talking to everybody and still getting the news." Interior Secretary Ryan Zinke signed an order Feb. 9 "aimed at improving wildlife management and conservation while expanding opportunities for big-game hunting across the West," Gary Harmon reports for The Daily Sentinel in Grand Junction, Colo. 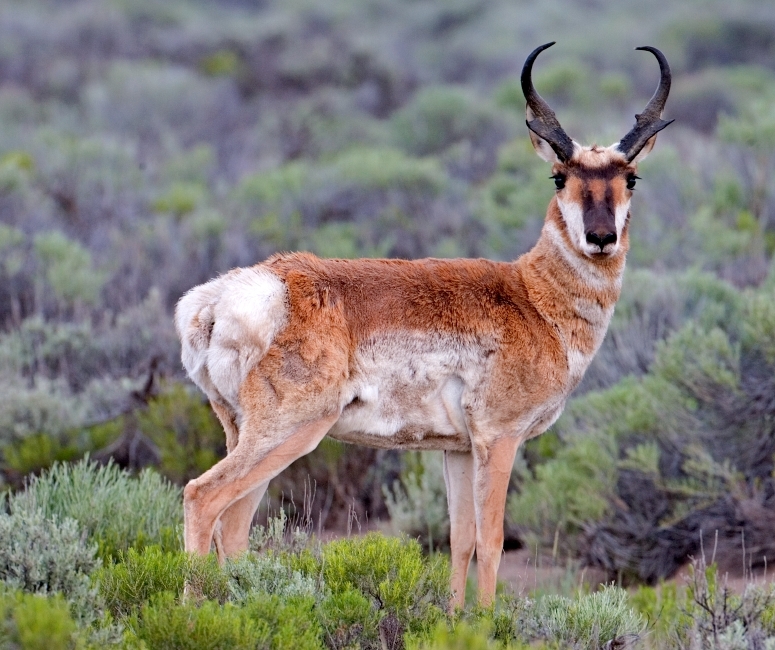 The Interior Department will work with state and local agencies to study migration habits of elk, mule deer and pronghorn and find ways to improve their habitat in priority states, including Arizona, California, Colorado, Idaho, Montana, Nevada, New Mexico, Oregon, Utah, Washington and Wyoming. The order calls on Interior agencies to appoint a department coordinator to work with states, federal agencies and conservation organizations to identify and map the migration corridors and winter range of big game animals; those planning to use land in migratory paths must develop site-specific management activities to conserve and restore big game habitats, Harmon reports. In her latest Axios column, Amy Harder provides us with a glossary of common terms seen in stories about energy and climate change. "Words matter! Especially sloppy ones in an amped-up media landscape where many don’t look past headlines," she writes. "It’s important to get this stuff right when extreme voices are louder than ever and the president openly doubts mainstream science." On "clean energy" and "green energy", for example, she writes: "Is it just renewables, like wind, solar and hydropower? Is it energy that doesn’t emit carbon emissions? Is it everything but coal, like this Washington lobbying coalition described it? The term is ambiguous and politically expedient. A better way: Specify the energy type." Read here for more. President Trump announced his long-awaited infrastructure plan today, calling for federal investment of $200 billion, $50 billion of it designated for rural areas. But most of the money would have to come from state and local governments. UPDATE, Feb. 14: "Hardly anyone believes that $200 billion federal dollars will produce an additional $1.3 trillion investment from non-federal sources, especially when state and local budgets are being squeezed by rising costs for education and health care," writes William Galston of the Brookings Institution. "The bulk of the dollars in the Rural Infrastructure Program will be allocated to state governors, giving states the flexibility to prioritize their communities’ needs," the plan says. "The remaining funds will be distributed through rural performance grants to encourage the best use of taxpayer dollars." The plan calls for "reducing regulatory barriers" to infrastructure projects, including faster permitting, with a “one agency, one decision” structure for environmental reviews, which could last no longer than two years. The plan says it is designed to spur investment of $1.5 billion in infrastructure, the great majority of it from state and local governments and private sources. "Critics say that will lead to higher state and local taxes, and an increased reliance on user fees, such as tolls, water and sewer fees, transit fares and airline ticket taxes," David Schaper reports for NPR. "Half of the funding, $100 billion, will be used as incentives to entice cities, counties and states to raise at least 80 percent of the infrastructure costs themselves. . . .That's a radical departure from the way many projects are funded now. Funding for federal-aid highways, including interstates, is usually allocated in an 80-20 federal-state split." Schaper reports, "Critics worry that would lead to only projects that could generate revenue, such as toll roads or bridges, getting funded." Revenue-generating projects are usually in urban areas; rural areas tend to rely more on direct government support. 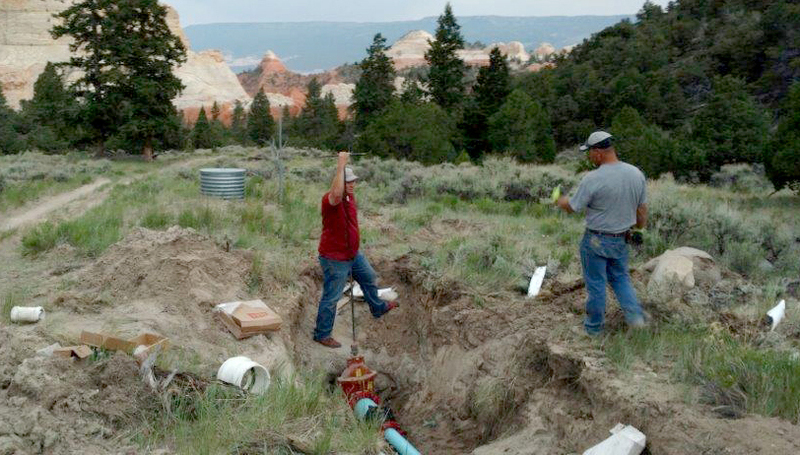 The plan also has a subsidy for the Rural Utilities Service, a Department of Agriculture agency that funds broadband, electric, water and wastewater projects, and new mineral-lease revenues to fund projects in national parks and on other public lands infrastructure. It also opens the door to sales of assets by government-owned utilities: the Tennessee Valley Authority, the Southwestern Power Administration, and the Bonneville Power Administration in the Northwest, The Daily Yonder reports. Schaper adds, "Senior White House officials who briefed reporters over the weekend say the plan is aimed at fixing the current system of funding infrastructure that they say is broken in two ways. The first is that the country has been under-investing in infrastructure, leading a state of growing disrepair. The American Society of Civil Engineers gives the nation a grade of D+ for the condition of transit, highway, bridge, rail, water and other infrastructure, and says the country is in need of an investment of $2 trillion more than is currently budgeted. The second way the White House says the system is broken is in the lengthy federal permitting process, which officials say can take five to 10 years or longer, driving up costs." This is a screenshot of an interactive map, available by clicking here. Suicide is more common in the U.S. today than at any time in decades, and "It's rural America that is sustaining the largest increases," Mike Maciag reports for Governing magazine. "The aggregate suicide rate for counties outside of metropolitan areas climbed about 14 percent over the five-year period ending in 2016. By comparison, the rate within metro areas also increased, but only by 8 percent." The more rural a place, the higher its suicide rate tends to be; the rate in the most rural places is 18.9 per 100,000; in big cities it's 10.6 per 100,000. The rate is highest in the West, but "Regional differences are largely a function of demographics," Maciag writes. "White men die at the highest rates, roughly 10 times that of Hispanic women and black women, because they tend to have greater access to firearms. Women, on the other hand, carry out more suicide attempts but generally do so using less lethal means. Gun ownership, which is more prevalent in rural areas, also explains why certain regions have higher suicide rates. Firearms account for about half of all suicide deaths. Research has found that mandating waiting periods, gun locks and other gun control laws are associated with fewer deaths." Another factor is probably the shortage of behavioral-health care in rural areas; "the vast majority" of people who kill themselves "suffer from a diagnosable mental-health issue,": Maciag notes. "The American Foundation for Suicide Prevention is pushing an approach known as 'Zero Suicide' that aims to improve care and outcomes for individuals at risk of suicide in health-care systems. The group is also focusing its efforts on emergency rooms and correctional facilities, two other places where people are at higher risk." The foundation's Jill Harkavy-Friedman told Maciag, “It’s not the economics itself but the associated stress that leads to physical or mental effects on health,” such as loss of health insurance form unemployment. Maciag notes research by Anne Case and Angus Deaton of Princeton University that has focused on what they call “deaths by despair,” drug overdoses and alcohol-related fatalities as well as suicides. "They found mortality among non-Hispanic whites to be rising for those without college degrees, and improving for more educated whites, blacks and Hispanics," Maciag writes. "The cumulative effects of few labor market opportunities and weakening social structures have largely contributed to worsening mortality for less-educated whites, although the authors note that economics alone don’t fully explain increasing suicide rates." 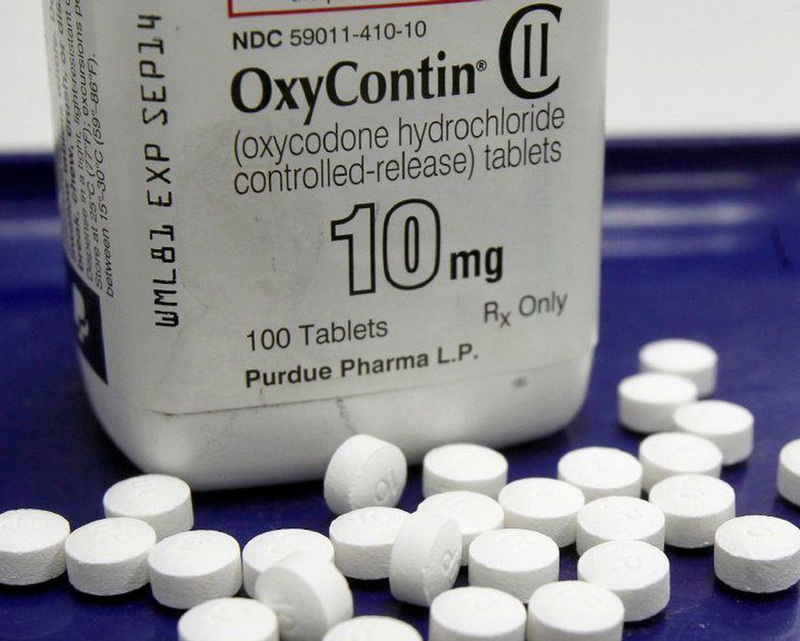 Purdue Pharma, the manufacturer of OxyContin, says it will no longer market its opioid drugs with visits to doctors' offices and it's halving its sales force. The move comes "after years of criticism and mounting lawsuits . . . claiming its sales practices are partly responsible for the opioid epidemic," reports Ben Poston of the Los Angeles Times. "It's pretty late in the game to have a major impact," Brandeis University researcher Dr. Andrew Kolodny, a longtime critic of the pharmaceutical industry's role in the opioid epidemic, told Poston. "The genie is already out of the bottle. Millions of Americans are now opioid-addicted because the campaign that Purdue and other opioid manufacturers used to increase prescribing worked well. And as the prescribing went up, it led to a severe epidemic of opioid addiction." The drug went on sale in 1996; in 2007, in federal court in southwest Virginia, Purdue paid $635 million in fines to end an investigation by the U.S. Department of Justice. Poston writes, "One remaining question is whether other opioid makers will follow suit and cease marketing the drugs to doctors, said Kolodny, executive director and co-founder of Physicians for Responsible Opioid Prescribing." "In an attempt to stem the abuse of OxyContin, Purdue spent a decade and several hundred million dollars developing a version of the painkiller that was more difficult to snort, smoke or inject," Poston notes. "Since those 'abuse-deterrent' pills debuted seven years ago, misuse of OxyContin has fallen and the company has touted them as proof of its efforts to end the opioid epidemic. But a study released in January 2017 found that rather than curtail deaths, the change in OxyContin contributed heavily to a surge in heroin overdoses across the country and that, as a result, there was 'no net reduction in overall overdose deaths'." States with the most OxyContin abuse rates had the largest increases in heroin deaths. 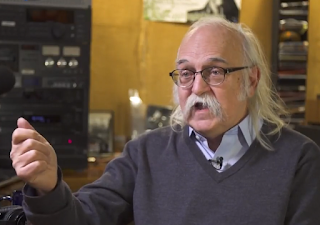 PBS NewsHour began its new "American Creators" series, "taking us to all corners of the country to see artists at work," Friday night with a long profile of Appalshop, the arts-and-culture cooperative based in Whitesburg, Ky., near the Virginia border, in the depressed Central Appalachian coalfield. Jeffrey Brown's eight-and-a-half minute report is hard to reduce to a blog post, but the essential quotes probably came from Ada Smith, who raises money and acts as a spokeswoman: "There’s been a long history of only seeing rural communities and economies as places to take from, and not places to invest in." Brown asks, "And Appalshop says otherwise, huh?" Smith laughs and replies, "Yes. We feel like there’s a lot of wealth and talent and ideas that need to be given a chance." That's a sharp summation of Appalshop, now in its 50th year. Started with a War on Poverty grant as the Appalachian Film Workshop, it soon expanded into other arts and cultural pursuits, started a radio station, a Roadside Theater and film-making workshops for young people, and recently expanded into economic development. 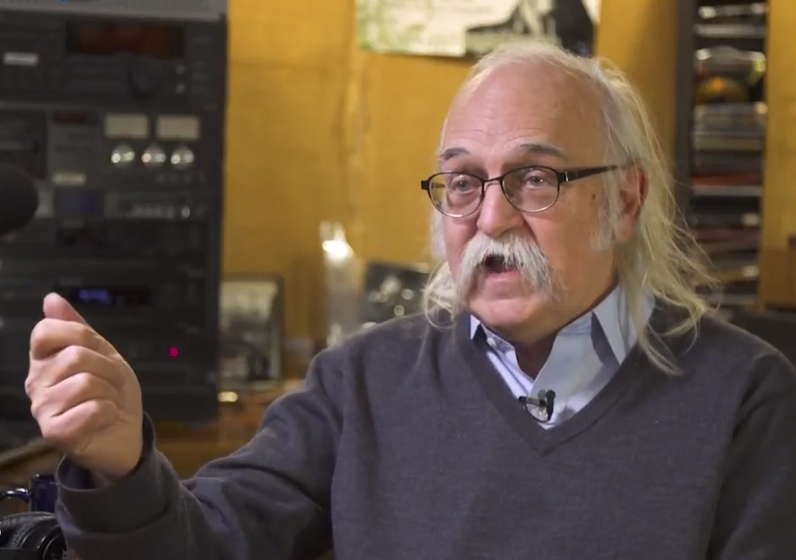 Smith's father, Appalshop filmmaker Herb E. Smith, recalls, his voice breaking, how fewer than 50 of Whitesburg High School's 1970 graduating class remained in Letcher County by that fall "with no hopes of ever returning. Generations of people, thousands and millions of people leave mining areas, and the people who remain miss them. Miss them bad." Appalshop "was a way to be a part of the solution, and to kind of understand the place that we were a part of." Appalshop has helped build a regional support network to encourage economic development, "with more than a dozen businesses and organizations in the area," Brown reports. When Gwen Johnson's Hemphill Community Center was in danger of closing because of a decline in coal taxes, "with encouragement and support from Appalshop, including $5,000 in seed money, Johnson was able to start a catering company to help pay the bills," and it hires inmates from the local drug court. Johnson said of Appalshop, "They’re friends who kind of stepped up to the plate and began to think outside the box, and sometimes they think bigger than some of us have ever been allowed to think."